Enjoy your holiday in Barcelona to the fullest and choose one of our fantastic self-catering apartments. Whether you’re heading to the city on a family trip, a weekend getaway or a few days in the sun with friends, we have the right holiday apartment in Barcelona for you. Choose your perfect place to stay from our wide selection of Barcelona holiday accommodation, from rentals right by Las Ramblas in the heart of the city centre to apartments with views of the spectacular Sagrada Familia. We also have hundreds of Barcelona beach apartments for those looking to make the most of the Spanish climate. Why choose a holiday apartment in Barcelona? Renting a Barcelona apartment is a great alternative to staying in a hotel. All our holiday apartments in Barcelona are self-catering, fully furnished and well equipped with everything you’ll need to enjoy a comfortable stay. What’s more, you can save money on eating out with the option of preparing meals in your own kitchen, and take advantage of your own living space, ideal for relaxing after an exciting day in the city. If you’re travelling with family or a large group of friends, you can stay all together in one of our three to six bedroom holiday rentals in Barcelona, many of which have multiple bathrooms for even more privacy and comfort. If you’re travelling solo or with a partner, take a look at our range of self-catering studio apartments in Barcelona, ideal for a short break. When choosing to stay in a Barcelona holiday apartment, you can really feel like a local and make the most of everything the city has to offer thanks to our selection of rentals in a variety of top locations. Rent an apartment with sea views and have breakfast against a Mediterranean backdrop, head right for the centre and step out onto the winding streets of the historic Gothic Quarter every day, or opt to admire some of the best Modernist architecture in the world with an Eixample apartment. 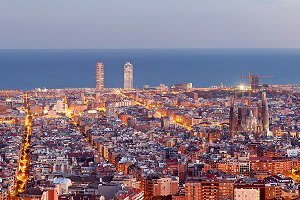 Why choose Barcelona for your holiday? Barcelona is the second largest city in Spain and is an incredibly popular holiday destination. Nestled in between 4.5km of Mediterranean beaches and the rolling Collserola Mountains, the capital of Catalonia has plenty to offer visitors. It is home to some amazing architecture, and is especially renowned for the colourful Modernist designs of Antoni Gaudí. The city also has many beautiful parks, top restaurants and a buzzing nightlife, not to mention a plethora of museums and cultural centres. • Visit La Sagrada Familia – Gaudí’s unfinished masterpiece and the most visited monument in Spain. The steeples of this magnificent church pierce the city skyline and offer a peek into the magical world of the Catalan architect. Amazing to see from the inside and out, a trip to this basilica should definitely be top of your Barcelona bucket list. • Try some tapas – If you haven’t yet tasted one of Spain’s most popular delicacies, then Barcelona is the place to do it! With thousands of eateries spread across the city, some of them even offering free tapas with a drink, there’s no excuse not to indulge in some delicious potato croquettes, ‘patatas bravas’ and spicy sauce, or even some of the country’s famous jamón ibérico. Don’t forget to wash it down with a glass of Catalonia’s own cava. • Cheer at Camp Nou – This awe-inspiring stadium is a great experience whether you’re a football fan or not. Home to champs FC Barcelona, you can head here for the excitement of a match day or get to know the ins and outs of Barça with a tour around the museum (the most visited in Catalonia) and stadium. • Picnic in Park Güell – Enjoy spectacular panoramic views of Barcelona from Gaudí’s magnificent park, full of green spaces and eye-catching mosaics. This one’s ideal for a family day out or even a picnic for two. • Relax at the beach – Each of Barcelona’s seven golden beaches offer something a little different. Whether you’re looking to soak up some rays and take a dip in the Med, relax with a few drinks at one of the many ‘chiringuitos’ (beach bars) or even get stuck into some water sports, the beaches of Barcelona won’t disappoint.